This term we would like to reintroduce a voluntary one way system in an attempt to reduce traffic congestion round the school. The one-way system has worked very well in previous years. It makes the flow of traffic safer for pedestrians and easier for drivers. The proposed one way system detailed on the map will help to avoid cars meeting head on and jamming up the roads. 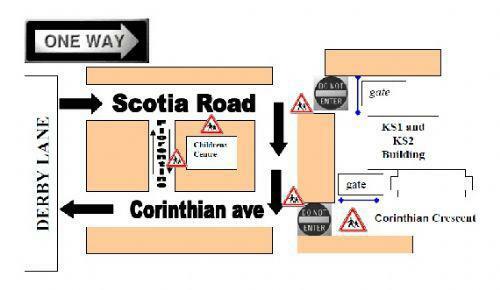 Parents are also requested not to park outside the school gates in Scotia Road, or enter Corinthian Crescent. These areas are highly congested with children and parents at the end of the school day.